At work, I signed up for the lunch program offered through the OSU Faculty Club. I pay a flat fee every month, and then get unlimited lunches at the club through the month. It’s worked out to be a fantastic deal. I get a variety of decent meals, including soups, salad and sandwhich bar, plus a hot dish and dessert. The fare is certainly better than greasy fast food, both in terms of content and flavor. I eat most days with a few of my immediate coworkers, as well as a few fellows in different departments within our college. Conversation and comraderie make the meals especially nice. And I get a nice stroll across the Oval, to stretch my legs and get some fresh air. In addition to lunch, I’m also eligible to purchase tickets for the many fine programs the club offers. Last month I took my dad to a Tequila tasting event. 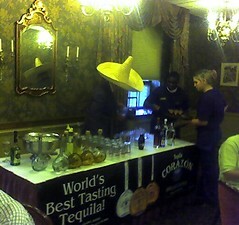 The presenter told us all about tequila, and provided us with samples of four different products from Corazon, plus a fifth sample of some generic well tequila for comparison. It was a very informative presentation, and I’m glad I attended for that alone. Three other things made the evening particularly worthwhile. First, we were seated at a table with a handful of other folks, all of whom were interesting. It was a lot of fun to chat with these people, and share the evening with them. Second, the food served was exquisite! Four flights of food were served, and although each plate looked like a small portion by itself, I was completely satisfied by the end of the event. And finally, the presenter had a lot of character, and made it a point to don his huge hat with a flourish in order to make “authentic” margaritas! 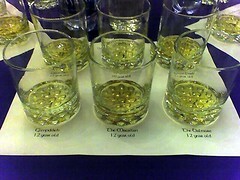 Tonight I took dad to a Scotch tasting event. Dad and I both quite like single malt Scotch whiskey, so we were really looking forward to this. We were both anticipating another delicious meal, too! The presenter wore a kilt, and shared quite a lot of information with us. He was very upfront with us, and explained that he wasn’t going to argue with anyone about taste, or preference. Some folks like some Scotches, and not others, and it wasn’t his job to say which was for who. He also announced that he would not try to tell us there was a “proper” way to drink Scotch. He encouraged us to put a small splash of water into the Scotch, to help activate the flavor, but he made it clear that this was his preference, and we weren’t required to follow his lead. We learned the same suggestion when we were in Edinburgh, so dad and I weren’t taken aback by the suggestion to “dilute” the Scotch. 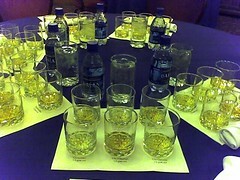 Personally, I prefer not to add water, as I genuinely like the full-bodied taste of most single malts I’ve tried. I’m looking forward to more such events at the Faculty Club in the months ahead!